Jack Crevalle: The jack crevalle is what is commonly known as the poor man’s gamefish because they fight hard and it doesn’t take a whole lot to find them. They can be found in sizes ranging from one pound to over forty pounds, from the inshore waters sometimes out to 200 feet. They are known for their voracious appetite, their hard fought battles and the fact that they sometimes travel I. Large schools. They are considered purely a sport fish and if harvested are generally used for shark bait. Jack Crevalle Fishing Tips: The jack crevalle can be caught by a variety of different methods. 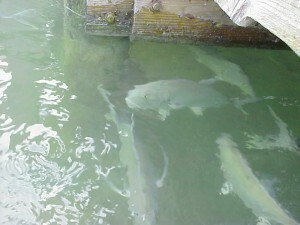 Primarily, they are caught while live baiting for kings and tarpon on the beach. But, if a school is located, they can be sight fished with live bait or artificial lures. For artificials, plugs and jigs will both work well, but a big surface popper can bring the most incredible bites. Occasionally while bottom fishing for grouper, one of the big crevalles will jump a bait intended for grouper.